Theme will fit on each device from small phone to large desktops. Start your mobile campaign with responsive design. Theme looks great even on Retina and high-resolution displays. Everything is sharp wihtout blurry icons or backgrounds. Choose from prepared color combinations. Every color is precisely picked to retain the content to be readable and usable. Theme contains WooCommerce integration. It is ready for your eCommerce solution. Get better rank for your website in search engine results page and improved user experience. Template is fully compatible with the WPML multilingual plugin. You can translate your website to any language. Visual Composer on CodeCanyon now and take full control over your WordPress site with our premium Frontend and Backend page builder plugin. Build any layout you can imagine with drag and drop page builder plugin – no programming knowledge required. 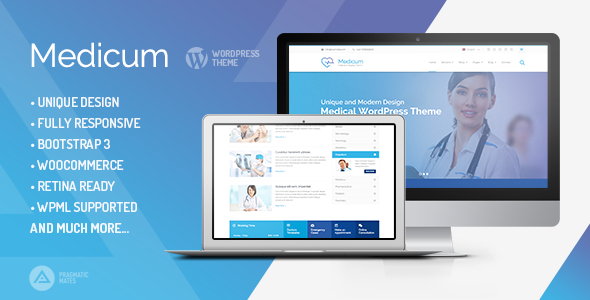 Theme is supported so feel free to contact us through comments system on ThemeForest or use our profile form on ThemeForest. Theme meets all basic requirements and best SEO practises. The images presented on site demo are not included in the package! Placeholders are used instead.